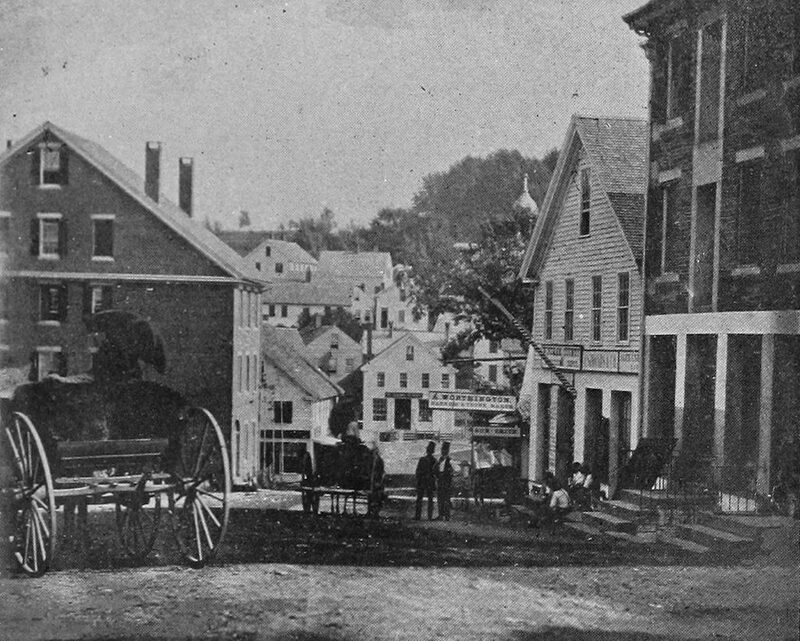 Looking south on Main Street from Elliot Street in Brattleboro, around 1850-1851. Image from Picturesque Brattleboro (1894). Brattleboro was founded in 1753, as one of the earliest towns in Vermont. For the first century it saw only modest growth, but by the mid-1800s it had grown into a small but prosperous mill town. This was aided in part by the arrival of the railroad in 1849, and over the next few decades the town saw considerable growth, more than doubling its population between 1840 and 1880 and becoming an important town in the southwestern part of the state. This growth contrasted sharply with that of Vermont as a whole, which saw a population increase of less than 14 percent during this same period. The first photo is among the earliest photographs of downtown Brattleboro, showing the town as it appeared around 1850 or 1851. Main Street began to acquire its current form around this time, and many of the present-day brick commercial blocks were built during this period. The first photo shows a mix of the older wood-frame buildings, with a few newly-built brick buildings. These included the building on the far right, which was apparently the rear portion of the 1849 Revere House, and the Van Doorn Block on the far left, which was built in 1850 and is still standing today. Today, more than 160 years later, the Van Doorn block is the only surviving building from the first photo. Some of the buildings in the distance at the bottom of the hill were destroyed in the 1869 Whetstone Brook Flood, while others – including the Revere House – were destroyed in fires. However, almost all of the major changes in this scene occurred more than a hundred years ago, and by the early 20th century this scene had largely taken on its present appearance. Starting on the far left is the yellow brick American Building, which was constructed in 1906. Just beyond it to the right is the 1900 Ullery Block, which hides most of the Van Doorn Block from this angle. The other side of the street includes the 1877 Pentland Block on the far right, the large 1915 Barber Block just beyond it, and the 1936 Art Deco-style Latchis Hotel, which is barely visible near the center of the photo. 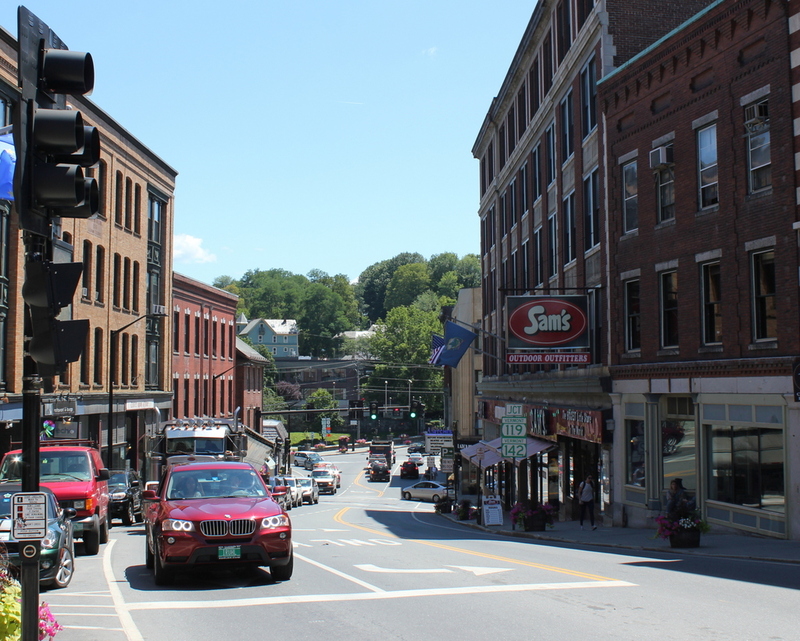 Today, all of these buildings are now part of the Brattleboro Downtown Historic District, which was added to the National Register of Historic Places in 1983.